We have to admit, we were not entirely certain about this slot when we first heard of it. While it is far from the only sweets related game (Thunderkick’s Sunset Delight comes to mind), the choice of name just feels out of place for this one. 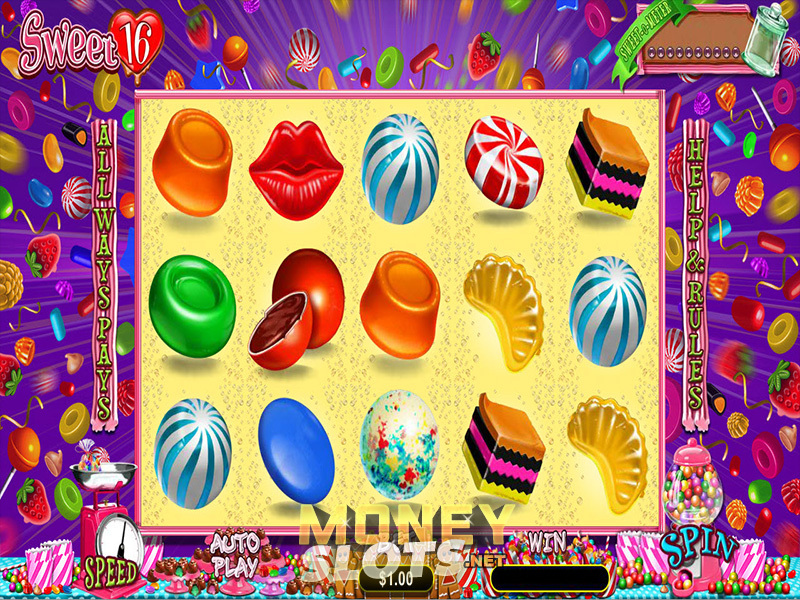 Regardless, if you have a sweet tooth, you will fall in love with this 5 reel, 243 payline slot. RTG’s December release will have you drooling at the mouth as you wander along its sugar-coated reels. It has only one actual bonus feature, but thanks to the morphing symbols and multipliers included in Sweet 16, it does not feel boring as you spin the reels. But does the game have what it takes to make it stand out, or will RTG’s final release in this year be a somewhat bitter disappointment? The sheer variety of unique symbols drawn for this slot impressed us. Different coloured candies, jelly beans, caramels, cakes, and a pair of ruby-red lips that sort of break the mould here, but I suppose if we are talking about sweet things, they fit right in. Wilds are drawn as the game’s logo – a large, red heart with Sweet 16 written on top of it. Appearing on reels 2, 3, 4 and 5, Wilds can appear grouped together, and will replace any icon except the Scatter. Always welcome sight, as because of the wide range of symbols, Wilds can change a certain loss into a definite win. Scatters are a large, swirl-shaped lollipop, which awards its own cash bonus on top of being used to activate the bonus feature. A finger-licking bonus in case you are so lucky to get five Scatters – as it will give you the same amount of money as the highest paying icon in the slot. The paylines in Sweet 16 are fixed, and we can only imagine the nightmare that it would be if you were allowed to adjust it. However, the bet level can be changed, ranging from $0.25 up to $6.25. Though high rollers will undoubtedly be disappointed with the limit being so low, alongside morphing reels, things can quickly get out of control. If you were looking to sweeten up your December, make use of the cascading reels system that RTG’s release offers you. Each time you make a winning combination, those symbols disappear, and new ones appear in their place. This has the potential to chain wins together, and to make sure people don’t get too lucky, RTG imposed a maximum limit of x2000 your wager. And to make things better, each time you successfully morph the icons, you increased your multiplier by one. You can get up to a x10 multiplier with a lot of luck, but we personally have not ever managed to reach those heights. We mentioned candy being the focus of the game, and the backdrop is no exception to this. Various sweets are outright exploding from the reels, as it seems even the slot is having a sugar overload. The music playing in the background is about what you would expect for a game like this, but it gets old really fast, and we recommend turning it off. Finally, three Scatters anywhere on the reels will activate the free spins bonus. You are awarded 16 bonus games, and the morphing multipliers range increases from x2 up to x20. And as a cherry on top of this sweet cake, free spins can also be retriggered. The base game itself will not feel too exciting. For large wins, you want to rely on a mixture of special features and morphing reels.